U.S. Sen. John Cornyn will deliver a State of Congress address at the Knapp Medical Center in Weslaco Jan. 12. The speech was originally planned for Dec. 1, but got postponed due to negotiations of the tax-overhaul bill. Sergio Contreras, president of the Rio Grande Valley Partnership, said the Republican Majority Whip’s speech will likely cover international trade, tax reform legislation, health care and the continuing education of the Rio Grande Valley workforce. The RGV Partnership, an organization that tries to spur business growth in the Valley, is sponsoring the event, and Contreras cautioned that Cornyn’s speech topics are still in motion. The Texas senator’s event is scheduled to last an hour and a half, Contreras added. He did not know if Cornyn had any other plans while in South Texas. This will mark Cornyn’s first visit to the Valley in 2018, following two trips in 2017. In February, Cornyn brought Sens. Dean Heller, R-Nev., and Thom Tillis, R-N.C.; along with Reps. David Rouzer, R-N.C., John Carter, R-Round Rock, and Mike Conaway, R-Midland. The group toured a detention facility and the Pharr-Reynosa International Bridge, as well as a U.S. Customs and Border Protection boat tour. 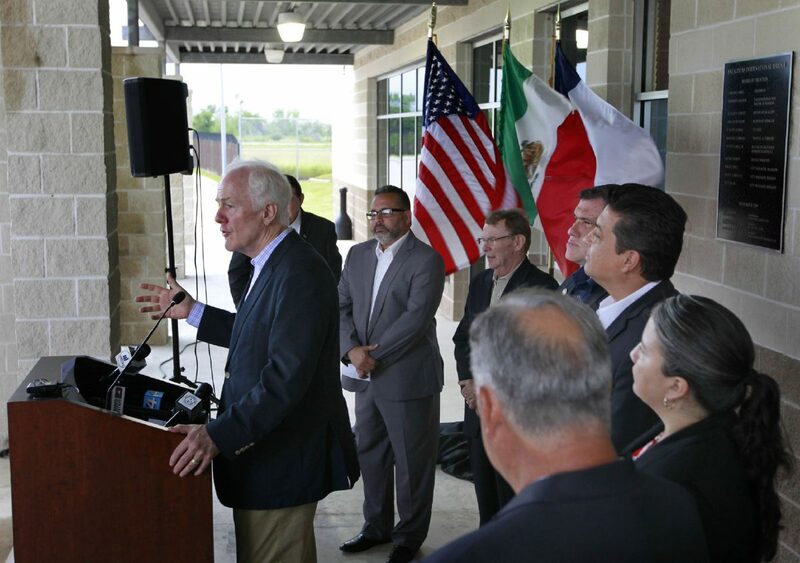 In April, Cornyn visited the Anzalduas International Bridge and was awarded a plaque for his work on the bridge system over the years.